Can Tasmania be the “battery of the nation”? And if so, what would that mean? Back in April, in the wake of Prime Minister Malcolm Turnbull’s pledge to develop Snowy Hydro 2.0, the PM joined Tasmanian Premier Will Hodgman for a less heralded joint press conference in Launceston, where they talked just as enthusiastically about the future of Hydro in Tasmania. By spending $3 billion, Mr Turnbull said, the island state’s scheme could be expanded to add enough pumped hydro storage capacity to the National Electricity Market (NEM) to run half a million homes. The commitment itself was for an investigation. 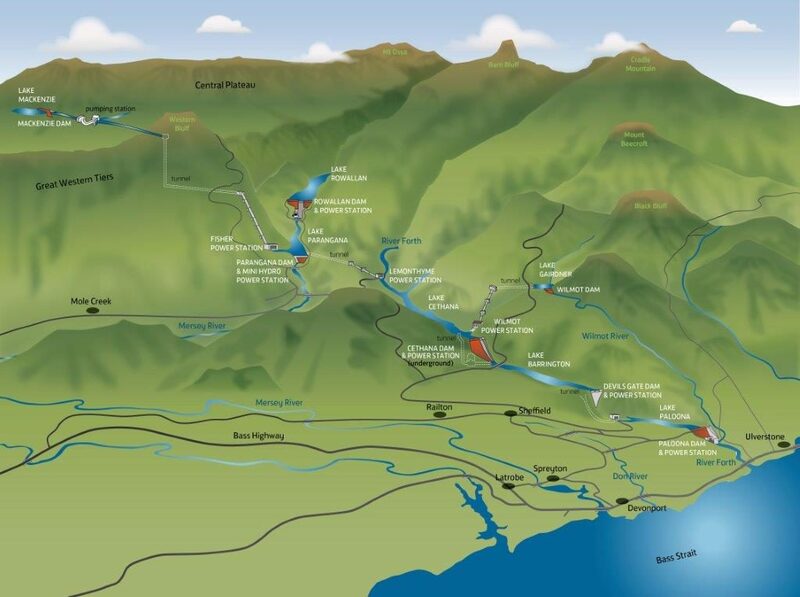 ARENA dedicated $2.5 million to help state-owned Hydro Tasmania examine the feasibility of expanding two power stations, building up to 15 pumped hydro projects and assessing the role of Tasmania in the future NEM. Pumped hydro involves using excess electricity at times of low demand to pump water up hills. It is stored until times of high demand, when it is released to flow back down through turbines, generating electricity. Five months on, the first two projects have been scoped, with studies promised by the end of the year. The first is considering a complete rebuilding of the 79-year-old Tarraleah power station, in the central highlands, and the addition of an extra turbine at the much younger Gordon power station, in the south-west. An early estimate suggests the Tarraleah expansion could cost $750 million and boost generation capacity by 200 gigawatt hours a year. 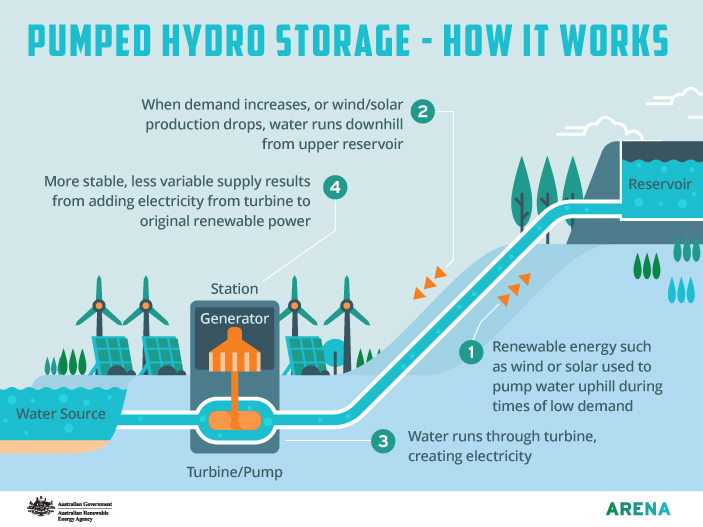 The second will look at a significant expansion of pumped hydro in the state – up to 15 new storage sites with a combined potential capacity of 2.5 gigawatts. 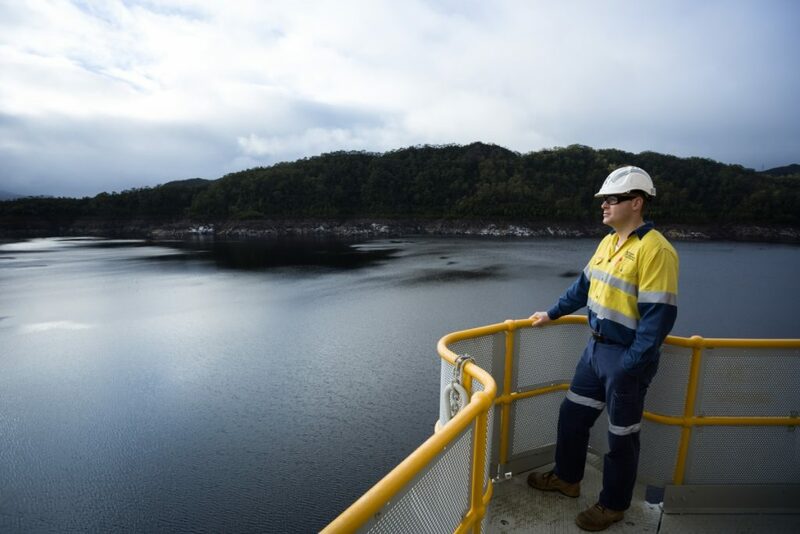 On a site visit to Cethana Power Station, alongside the Tasmanian Premier, ARENA Chief Executive Ivor Frischknecht said these studies would examine how pumped hydro could play an expanded role in Australia’s energy mix. This would be no small thing. While the Snowy Hydro has a storied place Australia’s national mythology, Tasmania’s hydro network is no less important and actually generates more electricity. It is used mostly for baseload generation, providing more than 80 per cent of the electricity generated in the state. By contrast, the Snowy is mainly used as a peaking plant, called on at times of high demand. It means that, while Hydro Tasmania has only half the generation capacity of Snowy Hydro, it produces about twice as many electrons. Chris Twomey, ARENA’s investment manager, says one of the questions to be considered is whether the way Hydro Tasmania’s plants operate needs to change to play a new role in a transformed future electricity grid – and, if so, whether they are capable of making that change. Specifically, will it still be needed as a baseload generator in a system of increased variable renewable energy backed by dispatchable generation – demand response, lithium ion batteries, peaking gas plants and pumped hydro – that can be called on when needed? This is the other part of the Hydro Tasmania “battery of the nation” project – effectively, a complete re-think of its business model. 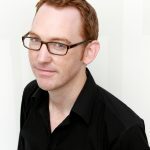 This third feasibility study, the details of which are being finalised, will take a big picture view of whether Tasmania could play an expanded role in the National Electricity Market that includes not just pumped hydro, but also a bank of wind farms in the north of the state to capture the roaring ‘40s – the best wind resource in the country – and a second interconnector linking the state to the NEM. The possibility of a second connection across Bass Strait was examined in a report earlier this year by former Australian Energy Market Commission head John Tamblyn. The report made clear that the viability of a second interconnector, with an estimated cost of $1.1 billion, was dependent on a number of factors. The answer ultimately turned on the assumptions you make about other changes in the electricity grid and forms of generation in the years ahead. But Dr Tamblyn found it would likely improve reliability of supply in Victoria and Tasmania, and boost the viability of new Tasmanian wind farms. Mr Twomey says: “It would be a big opportunity for Hydro Tasmania to play a key role in the provision of energy storage capacity to the national electricity market. The first stages of the feasibility studies are due before the end of the year. A map shows the area and planned project around Cethana Power Station. IMAGE: Hydro Tasmania.